In 1947, T&S introduced the first pre-rinse unit to the food service industry. Within 4 decades, we had already innovated it into the first low-flow unit designed to save water and energy. Our pre-rinse units were the first to be endorsed by the Green Restaurant Association, and the T&S name has always carried the assurance of top-quality performance and unbeatable service. Today, T&S has taken pre-rinse innovation to the next level. We have completely overhauled the B-0107-C spray valve used in our pre-rinse units, keeping all of its superior construction while dramatically reducing the amount of water it uses. You may be familiar with EPACT, the Energy Policy Act of 2005. That legislation set a maximum flow rate for spray valves at 1.6 gallons per minute at 60 psi. You may also be aware that T&S spray valves have always beaten this standard, some by as much as 25%. Our new B-0107-C spray valve performs at only 0.65 gallons per minute at 60 psi. 0.65! That's a water saving of 60% over EPACT's standards. 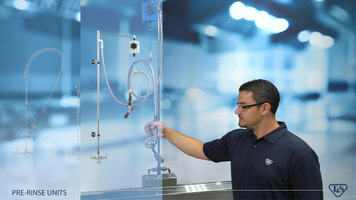 Now, you may be thinking that the flow rate may be lower, but what about the performance? I may be saving water, but surely it takes longer to clean, right? Wrong. T&S subjected our new B-0107-C valve to the dried-on tomato paste test using the most stringent state standard. California requires a clean plate after only 30 seconds. In addition, other organizations' requirement are 26 seconds or under. At T&S, we have always endeavored to beat this time with our spray valves to reach a more stringent goal of 21 seconds or less. Even though the new B-0107-C valve has a drastically reduced flow, it still cleans the plate within the strict California standard, as well as our own rigorous standard. Way less water, just as fast! How does our B-0107-C valve line up with the competition? Some manufacturers make pre-rinse units that only just meet the EPACT standard of 1.6 gallons per minute. Fischer's model flows at 1.15 gallons per minute at 60 psi, and the valve from CHG flows at 1.2 gallons per minute. The new T&S B-0107-C blows them all away with its amazingly low 0.65 gallons per minute, offering a savings of 100,000 gallons per year over a valve that merely meet EPACT's standards. Enjoy top-quality T&S construction, our outstanding service support, a spray valve designed to meet the strictest standards while still delivering the powerful performance and a low, low flow rate of 0.65 gallons per minute. Choose the T&S B-0107-C spray valve, and watch your savings begin to grow! Do you want to reduce your facility's water usage by 100,000 gallons per year? Imagine the cost-savings! Find out how the T&S B-0107-C pre-rinse spray valve can help boost the productivity and efficiency of your facility by checking out this quick, introductory video. Watch this video to learn more about the benefits of T&S' pre-rinse add-ons! 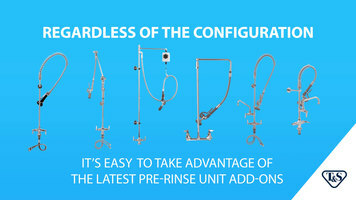 This video goes over the simple process of installing or converting a T&S pre-rinse unit. 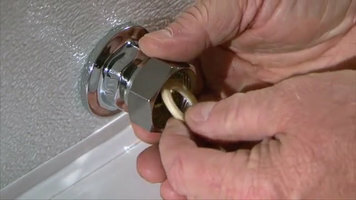 With 2 easy procedures, these faucets are sure to ease your experience.